Manfrotto has announced two new JOBY products, the GripTight PRO TelePod and the GorillaPod Mobile Rig, content creation tools for videographers, photographers and journalists that are designed to make shooting video and live streaming easy. The 12.7-ounce GripTight PRO TelePod is a telescoping tripod for creatives shooting video for live-streaming and social-media platforms. It’s compatible with smartphones, action cams, 360° cameras and other small-format devices like some mirrorless bodies and point-and-shoots. The TelePod has four modes: Hand Grip, Extended, Elevated Tripod and Tabletop Tripod. Capable of telescoping from 13.5 to 31 inches, the GripTight PRO TelePod has adjustable fiberglass reinforced nylon and stainless-steel legs that click and set into three positions. It features a grip-mounted, removable Bluetooth Impulse Remote Shutter, a tilting tripod mount for cameras, a cold-shoe PRO mount for adding lights and microphones, and a Pin Joint mount for GoPros and other action cams. Building on JOBY’s original flexible GorillaPod tripod, the 12.8-ounce GorillaPod Mobile Rig is a smartphone and action cam accessory for creatives shooting video and social media content. With flexible arms, the rig’s locking GripTight mount can hold up to three devices, such as mics, lights and GoPros, in addition to the smartphone. The GorillaPod Mobile Rig’s flexible, adjustable legs allow it to be used as a handle or a tripod, plus they can wrap around objects like poles for unique perspectives. The rig’s two 6-socket arms feature standard ¼”-20 tripod connections for securely mounting the smartphone and accessories, with two cold-shoe mounts and one GoPro mount. The GripTight PRO TelePod ($99.95) and the GorillaPod Mobile Rig ($99.95) are both available now on the JOBY website. Petaluma, Calif. – (January 4, 2018) – JOBY, makers of the original GorillaPod™ flexible tripod, today announced the first telescoping tripod for pro video content creators, the GripTight PRO TelePod. This new product is an ideal tool for vloggers and videographers working with smartphones, action cameras, 360° and other small format digital imaging devices to create content for social media platforms. This product supports the rapidly growing trend for real-time video content on social media platforms including YouTube, Instagram, Facebook, Snapchat and Periscope. 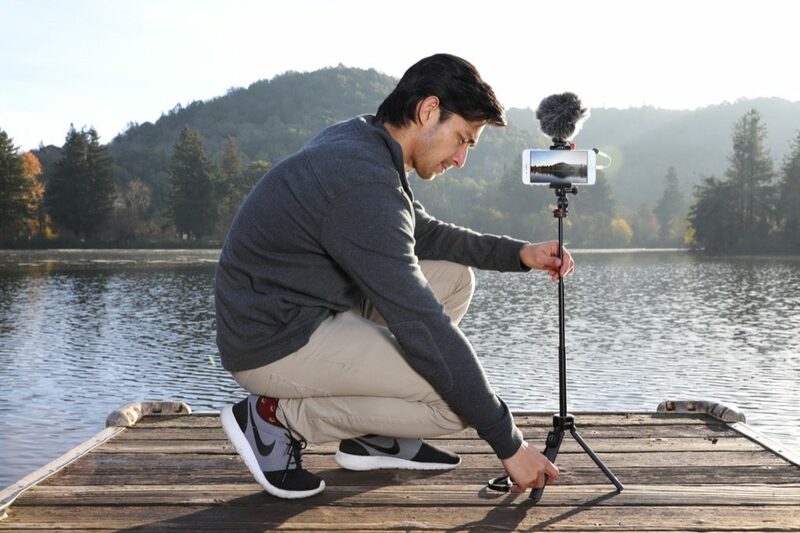 The GripTight PRO TelePod combines the function of a tripod with a lightweight extending pole for versatility in capturing unique perspectives. Advanced features include adjustable tilt for selfies and landscape or portrait shooting modes for standard horizontal formats like YouTube to vertical video for new platforms like Instagram and Periscope. Hand Grip: Need a firm grip on content? Simply close legs and hold. Ideal for capturing the magic of city streets over the holidays. Extended Grip: Looking to grab an overhead or 360° shot? Just close the legs and extend the mount to capture the action around you. Elevated Tripod: Need to stand and elevate the view? The mount and legs can be extended to create an elevated camera/360° Perfect for travel vloggers! Tabletop Tripod: Getting a little closer to the subject at hand? 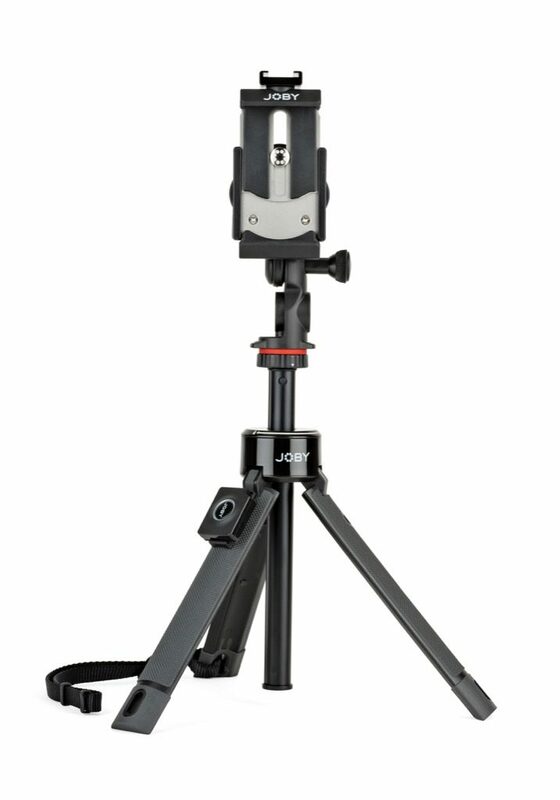 Create a compact tripod stand by expanding the legs and retracting the mount. Ideal for foodies capturing how-to images or videos. The GripTight PRO Telepod comes with a grip mounted, removable Bluetooth® Impulse Remote Shutter to capture shots without touching your phone. It includes a tilting tripod mount for cameras; a Cold Shoe PRO mount, to add lights and mics; and a Pin Joint mount for GoPro® and other action cameras, making it the ideal tripod for any situation, in any location. It has been built with durable fiberglass reinforced nylon and stainless steel and telescopes from 34 to 79 cm (13.5 to 31 inches) for extended reach. The adjustable legs click-set into three positions for stability on uneven surfaces and also flatten to a maximum of 36 cm (14 inches) for added stability in windy situations. 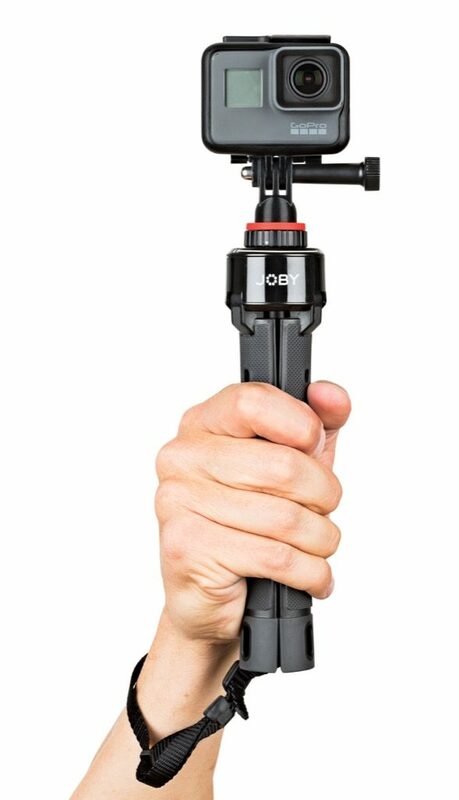 The GripTight PRO TelePod is immediately available on JOBY.com. For more information, please visit or follow us on Twitter, Facebook, and Instagram. We live to ignite your creativity. JOBY’s award-winning mounts, stands and grips are flexible, easy to use and designed to elevate the potential of the latest mobile and imaging devices. Our innovative accessories bring creative vision to the next level, empowering users to capture adventure from any angle. We redefined the tripod industry a decade ago when we developed the GorillaPod™ flexible tripod. For more information, please visit JOBY.com. Vitec is a leading global provider of premium branded products and solutions to the fast changing and growing “image capture and sharing” market. Vitec’s customers include broadcasters, independent content creators, photographers and enterprises, and our activities comprise design, manufacture and distribution of high performance products and software including camera supports, wireless systems, robotic camera systems, prompters, LED lights, mobile power, monitors and bags. We employ around 1,600 people across the world in ten different countries and are organized in two divisions: Broadcast and Photographic. Vitec’s owned brands; Avenger, Gitzo, JOBY, Lastolite by Manfrotto, Lowepro and Manfrotto are represented in the United States by its own direct distribution system, Manfrotto Distribution. Additionally, Manfrotto Distribution is the US distributor of Gossen, Metz, 360Rize, Shoulderpod and National Geographic. The Vitec Group plc is listed on the London Stock Exchange with a 2016 revenue of £376.2 million. 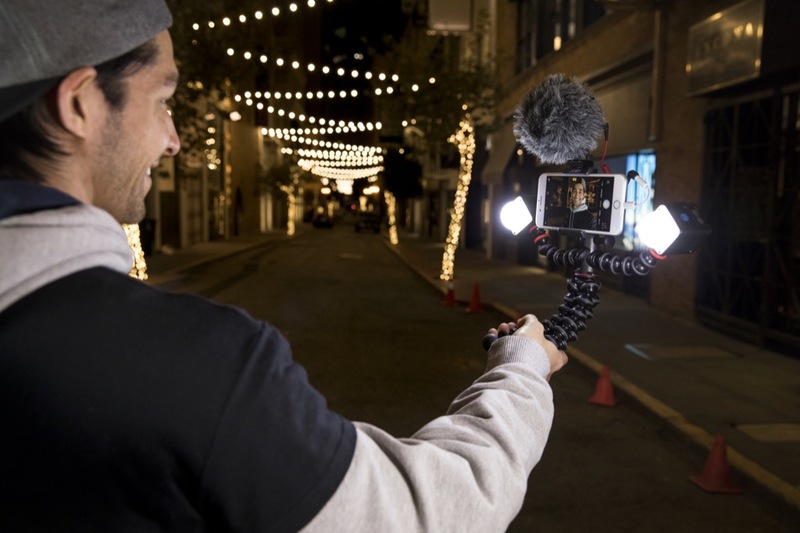 Petaluma, Calif. – (January 4, 2018) – JOBY, makers of the original GorillaPod flexible tripod, today announced the new JOBY GorillaPod Mobile Rig™, the perfect smartphone accessory for the creation of pro-grade videos, vlogs and YouTube® content. Taking design feedback from the active JOBY community of content creators, the GorillaPod Mobile Rig builds on the original patented GorillaPod design, with flexible arms for more versatility. Its secure mount works with any smartphone and up to three additional devices like mics, lights and GoPro® cameras. This product supports the rapidly growing trend for video content on social media platforms including YouTube, Instagram, Facebook, Snapchat and Periscope. The GorillaPod Mobile Rig is flexible, portable and easy to use, making it the essential tool for any content creator, vlogger or journalist creating pro-grade video. Advanced features include: adjustable tilt for selfies, and landscape or portrait shooting modes for standard horizontal formats like YouTube as well as vertical video for platforms like Instagram and Periscope. This versatility, combined with the ability to add up to three additional devices like mics, lights and action cameras via the standard ¼”-20 tripod connections, gives you the perfect mobile video rig. The GorillaPod Mobile Rig for any smartphone (US MSRP $99.95) is lightweight (362g/12.8oz) and leverages the patented GorillaPod ball and socket design with rubberized grips to provide endless flexibility and quick adjustability. The GorillaPod Mobile Rig securely mounts to any smartphone with a pro-grade, locking GripTight™ mount. 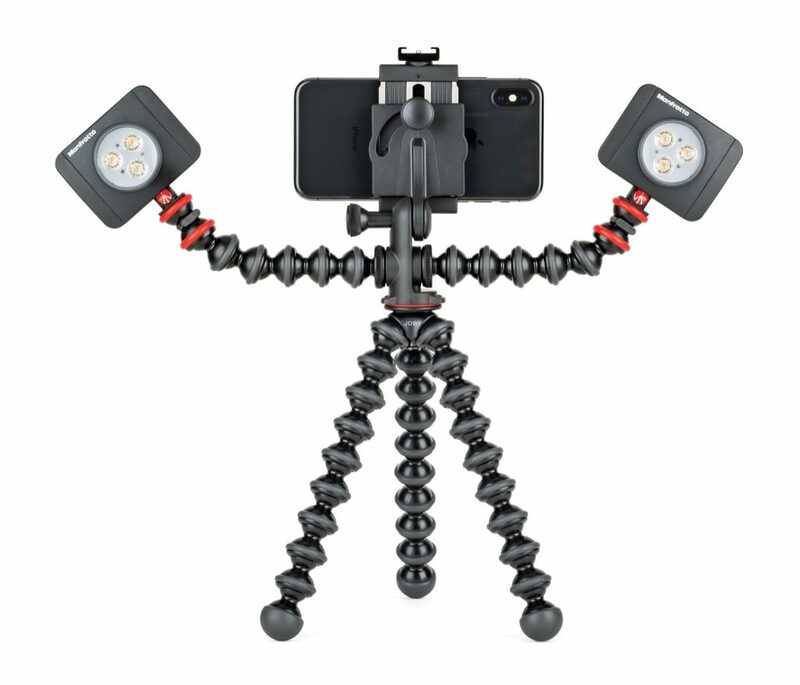 The flexible legs on the GorillaPod Mobile Rig can be used as a handle, wrapped around objects such as trees or poles for unique videos and images, or used as a tripod. The two 6-socket GorillaPod arms with the standard ¼”-20 tripod connections, two Cold Shoe mounts and one GoPro® mount provides content creators with the ability to add up to three devices at one time. 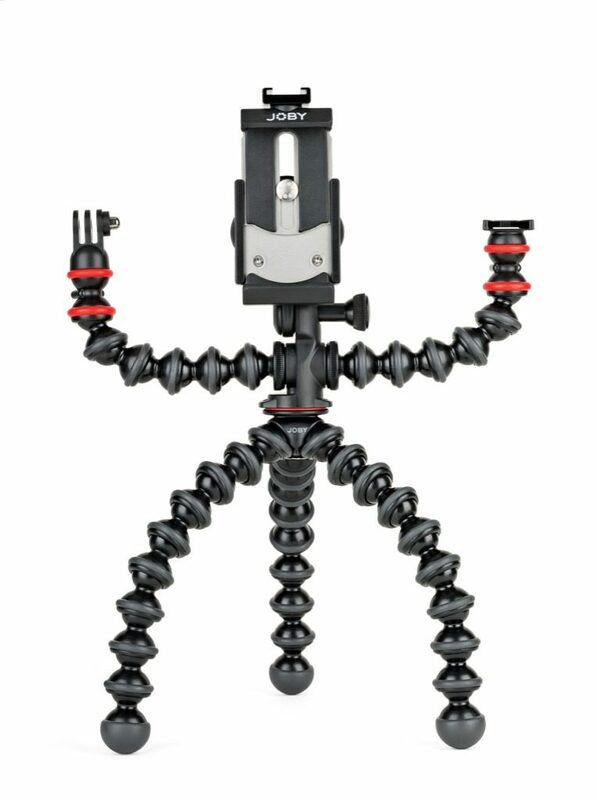 The GorillaPod Mobile Rig is immediately available on JOBY.com. For more information, please visit or follow us on Twitter, Facebook, and Instagram.